A loss of visual privacy is the No. 2 complaint from employees in offices with low or no partitions between desks, after noise. Visual noise, the activity or movement around the edges of an employee’s field of vision, can erode concentration and disrupt analytical thinking or creativity. Teams were 10% to 15% more productive when shielded them from supervisors’ view. The employees felt freer to experiment. “I wish there were such a thing as human blinders,” Maya Spivak wrote when the software company she works for asked her in a survey last year how she felt about her workspace. She was only half-joking. Her desk was near several colleagues’ desks. Blocking out their movement was a constant struggle. “I could barely ever focus,” says Ms. Spivak, marketing and communications director for San Francisco-based Segment. Her company overhauled its layout when it moved to new offices in April. Its former space was like a warehouse, creating “these long lines of sight across the workspace, where you have people you know and recognize moving by and talking to each other. It was incredibly distracting,” CEO Peter Reinhardt says. Segment’s new offices still have open workspaces, but the setup is more like a labyrinth, with walls, corners and large potted and hanging plants separating employees’ desks from passersby, “almost like a jungle,” Mr. Reinhardt says. (The plants help keep the noise down, too.) Employees’ workspaces are farther apart. Ms. Spivak sits in a corner between an empty workstation and an eighth-floor window with a skyline view, and she’s much more productive, she says. Some of Segment’s engineers work in separate team rooms. Being surrounded by teammates with similar work patterns can be comforting to employees. Unpredictable movements around the edges of a person’s field of vision compete for cognitive resources, however, says Sabine Kastner, a professor of neuroscience and psychology at Princeton University who has studied how the brain pays attention for 20 years. People differ in their ability to filter out visual stimuli. For some, a teeming or cluttered office can make it nearly impossible to concentrate, she says. “If we see a bunch of people gathering in our peripheral vision, we wonder, ‘What are they talking about? Did somebody get laid off? Are they coming to lay me off?’ ” says Sally Augustin, an environmental psychologist and principal at Design With Science, a La Grange Park, Ill., consulting firm. Being visible to bosses and colleagues can make workers in some jobs feel pressured to conform to others’ expectations, says Leigh Stringer, a senior workplace expert at EYP Architecture and Engineering in Albany, N.Y. If employees default to keeping their heads down and typing on their computers to look busy, rather than taking time to reflect or brainstorming with others, innovation or analytical work may suffer, she says. In an experiment with Chinese factory workers published in 2012, Ethan Bernstein, an assistant professor of leadership and organizational behavior at Harvard Business School, found teams were 10% to 15% more productive when they worked behind a curtain that shielded them from supervisors’ view. The employees felt freer to experiment with new ways to solve problems and improve efficiency when protected from their bosses’ critical gaze, Dr. Bernstein says. A loss of visual privacy is the No. 2 complaint from employees in offices with low or no partitions between desks, after noise, according to a 2013 study published in the Journal of Environmental Psychology of 42,764 workers in 303 U.S. office buildings. Some employers are dealing with such distractions by giving employees a lot of choices, allowing them to leave their desks and relocate to other kinds of workspaces over the course of a day, says David Lehrer, director of communications for the Center for the Built Environment at the University of California, Berkeley. AT&T has installed about 20 Steelcase Brody workstations at its San Ramon, Calif., offices. 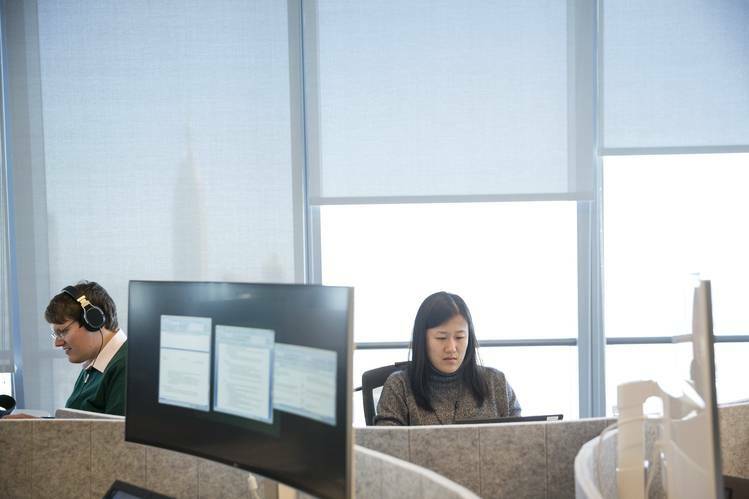 They have privacy screens on three sides to block distractions, says Colleen Randazzo, a tactical planner who worked with AT&T on converting part of its space from cubicles and private offices to open seating. The company also has 66 “focus rooms,” small rooms with a single desk. These are popular among employees because they allow them to close the door, turn away from the window and work facing a wall, she says. Boston Consulting Group installed 500 oversize, curved computer monitors at employees’ desks when it moved last November to new open-plan offices in New York City, says Ross Love, the firm’s managing partner in New York. Employees asked for the 34-inch screens, partly to help avoid distractions. The company also built in quiet rooms and other private spaces. Yieldmo, a New York marketing technology firm, installed 18-by-24-inch frosted-glass panels as a buffer between salespeople’s work areas when it moved recently to new space, says architect Ajay Chopra, founder of Echo Design + Architecture, New York. While many Yieldmo employees work at brightly lighted white tables amid white walls and carpeting, high-traffic corridors are more dimly lighted and painted in dark gray, with distressed-wood walls and dark concrete floors, says Rick Eaton, chief financial officer. The dark colors are less distracting to the eye, decreasing the temptation for employees to look up.